Whether renovating or moving to a new office, moving an office is hard to arrange. These difficulties can be either can be made all the worse if the company picks the wrong moving service for the move. Any operations manager trying to oversee this process will find themselves at whit’s end. Yet, there is another solution, a container moving company. These companies provide a storage container. After you fill it, they store and transport it. It may be a welcome alternative. Below are some reasons to consider a container moving firm instead. Particularly for big moves, a full-service mover will cost an awful lot. Meanwhile, a moving container costs only a fraction of that cost. Many would argue this is because they do not pack up things for you. However, since they only cover the container and moving, a container company can offer you a flat fee upfront. You can move everything in custom packaging or spend the additional money elsewhere. Meanwhile, a moving company will charge you more if it takes their men longer than expected to pack or unpack. For professional companies, this difference can mean a lot. There is nothing more secure then a locked metal box. At a moving company, your valuables and sensitive items will be handled over and over again by the company’s movers. Instead, with a container your employees load it, and when loaded it’s secured by you with a lock. There is no reason for the container company to open it as they move and store the container. As a result, your valuables are never out of your direct protection. Most storage containers are built of steel or heavy-duty plastic. This guarantees your office equipment is protected from the elements. A moving company can’t make a similar promise for their trucks and warehouses. 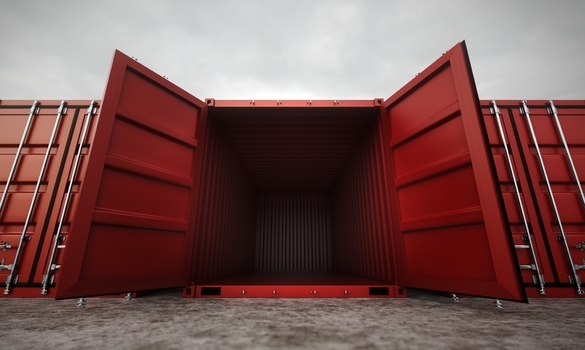 Most container moving companies make guarantees about their containers’ weatherproofing. As a result, you can be sure no costly equipment will be damaged in the elements. Storage containers are meant to be stored. As a result, it’s cheap to keep it in storage. If you need a few extra days to figure out how to furnish your new office, an extension won’t cost much. Long-term storage can also be arranged if your new office is not large enough for everything. For companies that are embracing a lean management approach, the flexibility can help keep costs low. Since containers are a standard size, it’s easy for the company to be accommodating to your needs. Storage container moving happens on your schedule, period. Moving company’s, who must arrange to have their movers arrive and schedule this with you working hours. A container moving company instead drops off the container when you request. You then fill it at your leisure. Afterwards, they pick up the container and move the office where you wish. It is then left as long as you need it to unpack. This means packing and unpacking happen to best accommodate your needs and working hours. This greatly simplifies the entire process. Moving an office is always going to be trying. There’s no reason to make it harder by putting your faith in a disinterested and expensive moving company. Container movers, by contrast, give you immense control over when and how you move your office. Not only that, but they are safer and more cost effective. Shipping and moving containers have changed how things move around this world in the last 50 years. You can make them work for you too.